Forward-thinking, innovative, focused. Focused on the changeless gospel of Christ. This describes the Center for Church & Change, an organization of WELS members needing a program, save-the-date postcard, posters and a banner for its November conference. I had the privilege of working with ConferenceDirect coordinator Michelle Eggert, CMP. Her efficiency and attention to detail made the project easy! For greatest accessibility, Church & Change wanted the program to be published online in portable document format (pdf). An online document presents special considerations. Some people will read it from their computer screens. Others will print it and read it in hardcopy. 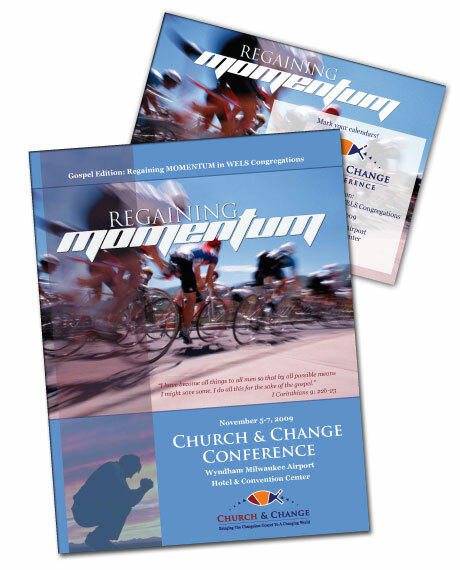 I designed Church & Change’s program specifically to accommodate both mediums and a variety of printing devices. We also offered viewers a black/white version for economical printing. Check out the program, check out the conference — they both look great!